Celebrate the talents of youth soloists on April 11 with the Orchestra of Southern Utah and three promising soloists. Every other year, the Orchestra of Southern Utah invites youth to audition to participate in a concert that features their music talents and abilities. A concert started to honor a beloved Cedar City teacher has grown into a concert that is looked forward to. It gives young aspiring artists the opportunity to be featured with a full orchestra. This year, the Roy L. Halversen Young Artists Concert will take place on April 11, 7:30 p.m., Heritage Theater. Aubrey Aikele, a Junior at Moapa Valley High School, will perform Piano Concerto No. 2, Larghetto Calmato by MacDowell. Aikele is a two-time soloist with the Southwest Symphony (2016, 2019) and will also solo with the Henderson Nevada Symphony in 2020. She has been studying the piano since she was four and has received Superior Ratings at the SUPAF Festival and Clark County Solo & Ensemble Festival. She’s been named the Most Outstanding Pianist at Castle Rock Music Clinic and studies with Brandon Lee of St. George, UT while also maintaining a private piano studio and serving as a staff accompanist. The Orchestra will then perform an original composition by Robby DeBry, a composition and jazz trombonist currently studying at Southern Utah University (SUU), entitled “Ashtoreth”. DeBry has studied composition from Keith Bradshaw and Douglas Ipson while attending SUU and has composed and had several of his pieces performed by various ensembles, including a debut work for wind symphony, Nyx and Erebus (2018). Ashtoreth will be a premiere performance and will be his first work for Symphony Orchestra. Aria Williams, a sophomore student from SUU, will perform Suite for Tuba by Don Haddad. Williams has performed in Honor Band and All-State band in Arizona and Nevada and currently participates in many ensembles at SUU including SUU Wind Symphony, Jazz Band, Brass Ensemble, as well as in OSU. She hopes to further her education in hopes of teaching music to future students. Following the soloists, the Orchestra of Southern Utah will then perform Symphony No. 5 by Mahler. They will perform the first, fourth, and fifth movements of the Symphony. This masterpiece was completed in 1902 following the composer’s near death experience and then his marriage. It was a two summer project in Austria and has extensive sections of elaborate counterpoint with contrasting themes. 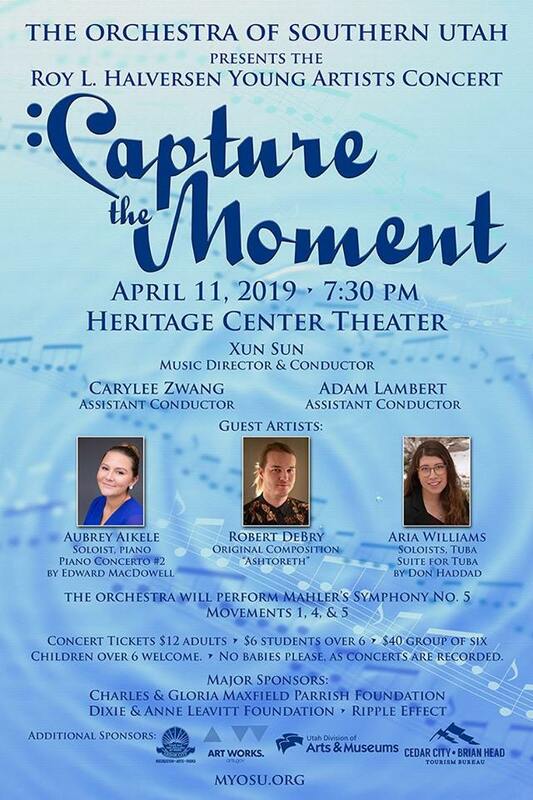 The Orchestra of Southern Utah would like to extend an invitation to all to join us celebrating the talents of these young artists at the “Capture the Moment: Roy L. Halversen Young Artists Concert”. The concert will take place on April 11th at 7:30 pm and will take place at the Heritage Center Theatre (105 N 100 E, Cedar City, UT, located behind Lins). Tickets cost $12 for adults and $6 for students. Children 6 and older are welcome to attend with adult supervision. No babies as concerts are recorded. For more information contact OSU Manager Rebekah Hughes at (435) 592-6051 or osucedarcity@gmail.com.